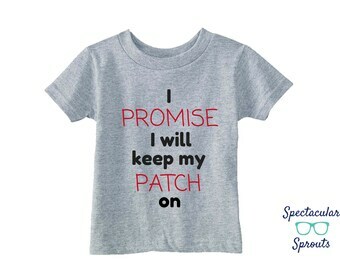 Announcement Kids Glasses T-Shirts - Baby, Toddler and Children Sizes. Personalized, Animals And More! 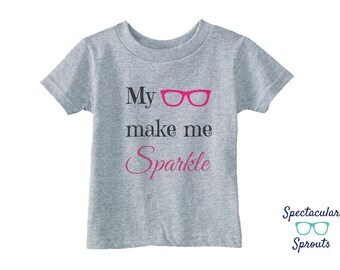 Kids Glasses T-Shirts - Baby, Toddler and Children Sizes. Personalized, Animals And More! So perfect. Thank you !!! I’ve been looking for a shirt like this for ages! It’s so nice to get a darling, personalized shirt of a character in glasses. I’ve been looking for a shirt like this for ages! It’s so nice to get a darling, personalized shirt of a little boy wearing glasses. Opening a glasses themed t-shirt shop for little ones was inspired by my son. He was born with bilateral cataracts and required 3 surgeries in the first couple of months of his life. He is now a lively 1 year old who wears glasses, contact lenses and patches one eye half of the day. My biggest hope is that he will grow up being proud of his glasses and patches. When life gives you lemons, make lemonade.. or t-shirts! All shirts are made with love; fueled by coffee and naptime. I love custom orders! I can make changes to the glasses colors, text color, add your child's name to most designs, add a bow to an animal, etc. I have had requests for shirts without glasses. Yes that can be done! Please contact me with any ideas you have. The sizing chart and measurements are shown in the last photo of each listing. Please refer to that when choosing your size. If you are looking for a smaller or larger size than what is shown, please contact me. We do wholesale orders. Please contact us to discuss this further. We are located in Canada and ship with Canada Post. Packages shipped to a Canadian address take approximately 1 week to arrive. Orders going to the United States take 1 to 2 weeks. Unfortunately Canada Post does not track their standard packages so you will not receive a tracking number. International orders take 2+ weeks to arrive.